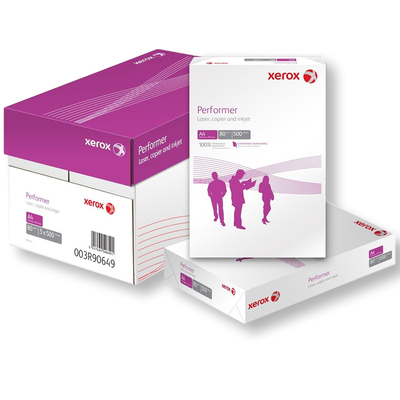 A staple in any office, school or work environment, choose our Xerox Performer A4 White Paper today. We know how much you use paper on a regular basis. That's why our large and economical pack comes with 500 sheets of high-quality Xerox paper. Each sheet has a gsm of 80 and comes in a standard A4 dimension - ideal for printers and scanners alike. For convenience, individual reams are sealed in a protective wrapper. This allows you to distribute the white paper throughout the office without the risk of tears, marks or soils on the paper itself. Suitable for high print runs, drawing, copying and much more, this large pack reduced the need for repeated replenishment while keeping your stores fully stocked up. This pack is a great tool for your Arts and Crafts projects. Why not pair it with our Vivid Card Pack for the ultimate crafting session or simply grow your Stationery stock pile? Oh, and don't forget to stock up on Ballpoint Pens for all those essential notes that need to be backed by vibrant colour.